This is the first game in the Mappy series. For other games in the series see the Mappy category. Mappy, like Xevious, is an early Namco arcade game that achieved great success in Japan, and very little success in the United States. Behind its cute characters and presentation is a surprisingly strategic platform arcade game that requires a lot of planning, and can become quite frantic. It runs on the same hardware as Super Pac-Man (two Motorola M6809 microprocessors running at 1.536 MHz), but modified to support horizontal scrolling. Since Mappy wasn't extraordinarily popular in the U.S., there isn't a lot of history to report. 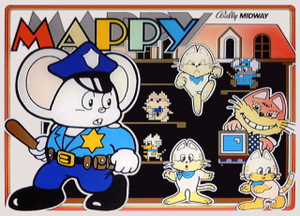 The name Mappy is likely derived from mappo (マッポ), a Japanese slang term (slightly insulting) for a policeman. The large red cat was known as "Nyamco" in Japan, which besides being a play on Namco, comes from nyanko (ニャンコ), the Japanese equivalent of "kitty cat". Nyamco was renamed "Goro" in the U.S. release of the game. Mappy (again, like Xevious) was ported to a large number of home computers and consoles in Japan, and (unlike Xevious) saw no American conversions. However, it has now shown up more recently in the United States thanks to the Namco Museum 50th Anniversary compilations, Microsoft Revenge of Arcade for Windows, and the Jakks Pacific Namco TV Games Plug-And-Play systems. The player takes control of Mappy, the brave mouse policeman. Mappy's mission is to retrieve all of the stolen treasure from the Meowky cat gang. They've stashed all of the loot in their leader's mansions which contain several floors, and also numerous trampolines that the Meowkies have to use to travel between the various stories. 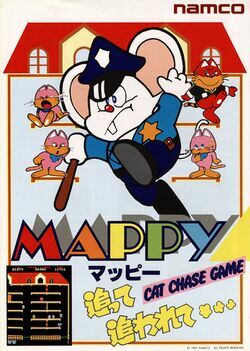 Mappy's job is only to recover the stolen goods, not to make any arrests, so you should not let him get near any cats (including the "Gosenzo" cat-coin) or it's lights out for Mappy. The player must direct Mappy through each of the Meowky gang's mansions with the two-directional joystick. You must collect every stolen item in the mansion to advance to the next round. Collect pair of items consecutively for bonus points. You must avoid contact with Nyamco and the Meowky cat gang while standing on a floor. If they catch you, Mappy will lose a life and must restart. Use the trampolines to bounce from one floor of the mansion to another. Mappy is (mostly) safe from harm while in the air - due to the Gosenzo. Press the door button to open and close doors. Use doors to block or shove enemy cats and temporarily stun them. Open a flashing door to emit a microwave that drives the cats off the screen for bonus points. If Nyamco is caught in it, he will double your points. In the bonus rounds, you must collect all sixteen of the bonus balloons as quickly as you can before the song ends. This page has been accessed 52,233 times.